Thanksgiving and Christmas feel like they are right around the corner to me. And with those holidays come lots of opportunities for you and your loved one to go to family gatherings and social occasions. 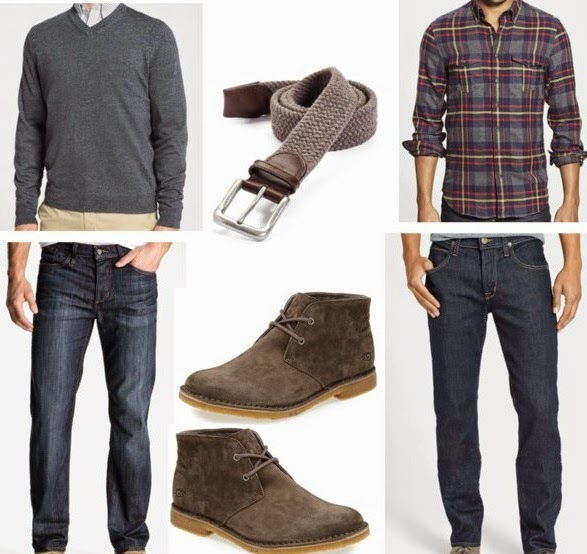 Today, I prepared a collage of jeans and other items that I think would look great on your guy at a family dinner or casual work event. I have talked a lot in the past about my belief in purchasing premium wardrobe staples, since they will last you a long time and allow you to buy less expensive accessories but still look incredibly stylish. I think the same idea is true for men, but the staples are much less expensive and the guys have to buy far fewer of them. In particular, for going out and casual events, etc, all a guy really needs is a fresh pair of jeans, a nice watch, and cool shoes. In my opinion, dark blue denim jeans and brown shoes are best as they go with the most. I bought my husband Matt a pair of these Hudson jeans and they are all he ever wears when we go out. Kind of ridiculous if you ask me, but he likes to keep it simple. Speaking of Matt I am always dragging him with me to Nordstrom. He really doesn't mind going because it is a great place to shop for men and women. He is always sneaking away to the cologne section to spray a new cologne on in search of the perfect scent. But seriously it is our favorite place to shop. I agree about the investment pieces - a good pair of jeans are so worth it! These are great pieces! I love the plaid shirt for my fiancé. I love this!! I'm constantly dressing my boyfriend because he likes to pretend he has no sense of style. I think a good pair of jeans are such a staple for men. Definitely one of the splurge pieces. I love the items you picked. Such classic pieces for guys. Love a good plaid shirt on my guy.